DOVER, NJ, August 7, 2018 -Casio America, Inc. is excited to announce the ECB800DB-1A as the newest model in its EDIFICE collection of men’s watches. 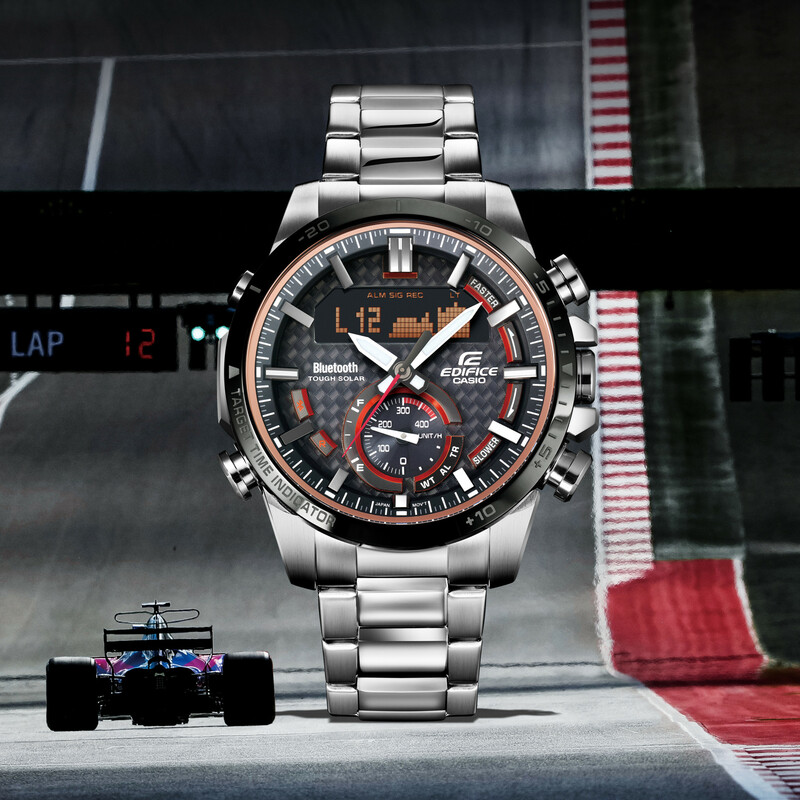 Inspired by elements found in motorsports such as speed, intelligence, and innovation, this smartly-designed men’s watch offers a bold design and enhanced timekeeping capabilities through smartphone connectivity.“We are thrilled to introduce the ECB800DB-1A to Casio’s EDIFICE collection," said David Johnson, Vice President of Casio’s Timepiece Division. “The new addition represents our continued commitment to delivering timepieces that offer sophisticated and bold designs, robust features and meet the needs of the on-the-go consumer. "To provide smart timekeeping, the ECB800DB-1A can be paired to a smartphone with just a push of a button through Casio's Mobel Link Technology. By downloading the Casio Watch App and connecting to a compatible smartphone via Bluetooth® SMART, the watch can access the correct time in its current location and for up to 300 cities worldwide, even updating with the latest time zone and Daylight Saving Time information. It also has improved accuracy by automatically syncing via the smartphone to a time server on the internet four times a day or it can be synced manually by a one-push reset to ensure ultimate accuracy.The ECB800DB-1A also comes equipped with Casio’s Tough Solar Power, which consists of a solar panel system that converts light to electricity and eliminates the need for frequent battery changes. This eco-friendly, solar battery-powered timepiece can be charged even in low or fluorescent light.Designed with a bold 3D dial and stainless-steel band, the ECB800DB-1A is also water resistant up to 100 meters and offers a full-dot STN display which enables a clear, high-resolution digital display of the alarm and 1/1000-second stopwatch functions. Additional features include a daily alarm, super illuminator, speed indicator, 200 lap memory, countdown timer, and more.Casio’s EDIFICE ECB800DB-1A will be available through Arizona Fine Time in August, and is priced at $270.00.